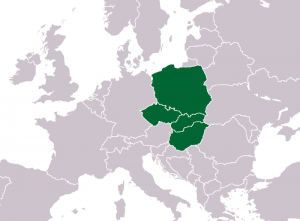 The Central Europeans nations of the Visegrad Group, which includes Poland, Hungary, Slovakia, and the Czech Republic, have declared the need to promote regional unity to fight the socialist, authoritarian dictates from Brussels. The four countries have been locked in a battle with the EU, fighting its agenda to promote open-borders, mass Islamic migration, Soros influence, and over Poland’s desire to reform its judiciary. “Czech President Milos Zeman began his visit to Poland Thursday with a meeting with his Polish host Andrzej Duda. Zeman said Poland, the Czech Republic, Slovakia and Hungary — members of the Visegrad Group — are under pressure to accept the views of the EU governing body, and should strengthen their unity to defend their own interests, reported Associated Press. Poland recently made concessions to the Union regarding measures to reform its judiciary which is rife with Marxist influence and unaccountable to the people’s elected representatives. Brussels had threatened to withhold funding in future budgets if Poland did not alter its course regarding such reforms. Hungary has been fighting the influence of Soros open-border NGOs, and associated pressure from Western Europe to take the pressure off other EU nations who have voluntarily admitted millions of Islamic, economic migrants from the Middle East and Northern Africa, to open Visegrad borders to the influx.